Easter is a big dang deal in South Louisiana. There's always a feast on Easter Sunday. We use every excuse to have a big meal with extended family. Easter is no exception. When The Husband and I were first married, we spent a couple of Easters at MaMa and Pop-Pop's, his grandparents. I thought my family did it big with the glazed ham, pans and pans of casseroles, bowls of veggies and salads, tray after tray of desserts. Uh-uh. Didn't touch MaMa's Easter spread. Just a ham? That's for wussies. MaMa baked a ham, roasted lamb, and smothered a pork roast. If she cooked three different meats, you can imagine how many sides she whipped up...in her frugally equipped farmhouse kitchen, I should add. But when it comes to Cajun Easter, there's actually something that tops eatin'. Paquing (pronounced pocking) the Easter eggs. What? You've never heard paquing? Well, bless your little heart! Where've you been? Just kidding. I lived only a couple of hours from Cajun country, but never knew the mysteries of paquing until I got married. 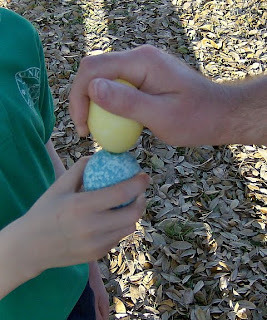 On Easter Sunday, Cajuns play a traditional game called paque (pock) or paque-paque. 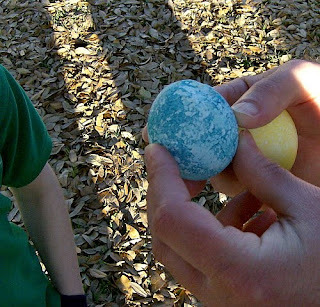 This game involves hard boiled eggs...your pretty dyed Easter eggs. Each person selects the egg he/she wishes to use during the game. 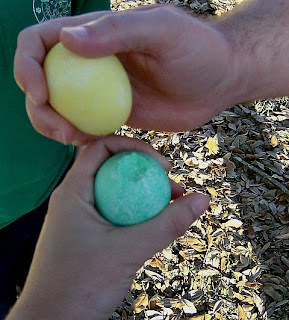 Two people square off, each holding their eggs firmly with the top exposed. They knock, or paque, the eggs together. The loser is the person whose egg cracks. The winner claims his/her opponent's egg. Then the winner moves on to the next victim...ur...player and a new round starts. The winner of that round claims the loser's egg. The Boy lost and has to give up his egg. I lost and gave up my egg. Somehow, The Husband ends up with all the eggs. I think he may have cheated. He's a dirty paquer. 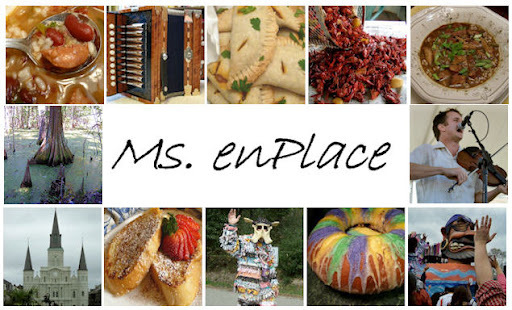 If you've been reading for a while, hopefully you've gotten a glimpse into the Cajun world-- and not just the food (that's one of my goals anyway). Hopefully you've come to see that Cajuns are fun-loving people who like to joke around. Practical jokes and trickery are common-place here. And we love it. 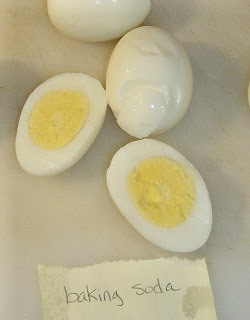 A lot of trickery goes on with paquing eggs. Dr. Barry Jean Ancelet, in his book Cajun Country, reveals that some devilish paquers use dyed goose or guinea hen eggs because they have harder shells. Some rough paquers use painted egg-shaped rocks. 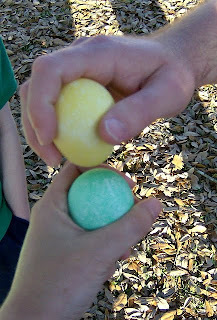 And some really crazy paquers sneak in uncooked dyed eggs just for grins. I've tried my hardest to find out how this game originated...I even got up off my lazy rear and went to the library (full disclosure: I work at the local library). I found out that Cajuns aren't the only people who paque. The custom is practiced in Belgium. People in Greece also paque--although they call it tsougrisma. How did all this tsougrismic paquing begin in Cajun country? I wasn't able to find a source that documented that piece of info. Probably because I was too busy thinking up sophomoric phrases. I am my father's child. By the way, if you are interested in Cajun culture, give the book below a read. It details the history of the Cajuns as well as their traditions, customs, and culture. Especially how they relate to music, food, and celebrations. The book is one of the most informative I've read on the subject. Ancelet, Barry Jean, Jay Edwards, and Glen Pitre. Cajun Country. Jackson: University Press of Mississippi, 1991. Every year just before Easter, people want to know the trick for perfectly hard boiled eggs...no green ring around the yolk, no hard to peel shells. And everybody and their brother pipes up with a no-fail method. I decided to conduct a not-so-scientific experiment and test a few of these methods out for myself. I cook my eggs for 8 minutes because undercooked eggs...well...I won't eat them. I don't find that running the eggs under cold water is enough, so I dunk them in a bowl of ice water. And it works! No green at all. Now for my next problem. Shells that stick. It's annoying. It uglies up the eggs. Not so terrible for making egg salad. But if my goal is deviled eggs, shells that stick, leaving me with hacked up looking eggs tick me off. Supposedly fresh eggs are more difficult to peel. 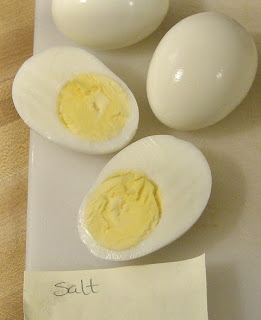 There are also numerous tricks out there that are supposed to make peeling eggs easier. After my experience with rotten eggs, I have to use the freshest eggs possible. So I decided to try some of these other tricks. 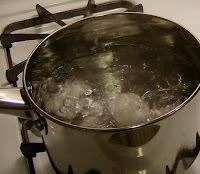 All eggs were cooked with the same water (tap) on the same stove, for the same amount of time. 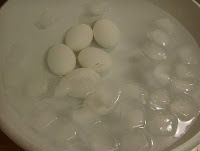 All eggs, no matter what the treatment, were shocked in ice water for the same amount of time. I wrote treatment names on each shell so I'd know which was which after the ice water bath. Different pots were used for each treatment since I don't have 4 pots that are the same. Salt added to the water: Beautiful, smooth surfaces & easy to peel. No shell stickage at all. 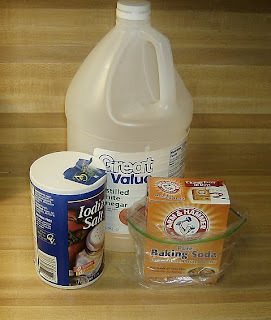 Baking soda added to the water: The shells stuck a little bit, but not on every one. The whole egg below was the worst looking one. Not bad, but not as good as the salt treatment. Vinegar added to the water: Out of all the additions, this was the worst. The shells stuck on every egg and more so than with baking soda, leaving me with gouges on every egg. Control (nothing added to the water): This was the worst overall. When compared to the other treatments, the shells here stuck like white on rice (ok, maybe not that bad). Lots of gouging on the surface of every egg. Not suitable for deviling. Boil your Easter eggs. Dye them. Have a paquing good time! What a great tip! Gonna go boil some eggs and try it out! Have a delicious Easter! Something tells me that this paquing is dirty business. If I was you, I would be looking for an egg-shaped rock and painting it in pastel colors;D You gotta get the hubby back for that! This is a great game for the kiddos. We'll have to give it a try. 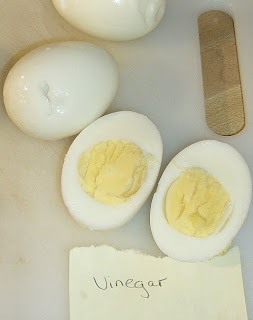 Love your experiment with the boiled eggs. I'm definitely adding salt to my water from now on! Happy Easter to you!! I love the Cajun life!! Or hearing about it from you. I just might go request that book from the library. 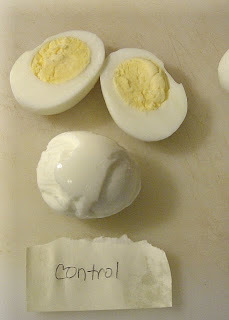 Don't forget about freezing your hard-boiled egg to gain an advantage. Never heard about the salt or baking soda, but since my girls are grown, married and live away from home I have to dye all my eggs alone. I boil and dye my eggs at the same time. Using 4 separate pots. I get the small packs of food coloring and to the water add a little vinegar and a small vial of food coloring to each pot. Eggs cooked and dyed all at the same time and colors are bright. Oh, I peel my eggs under running water. They come out really clean. We've always pocked eggs. We have an egg pocking tournament because we're such a large family. My father-in-law is responsible for making the tournament bracket. He announces who has to pock with whom. If you win your pock, you move on to play another winner.Eventually a winner is announced. Then it's time to pock the big ends. At the end there is an official winner who is awarded bunny ears and a chocolate bunny. The big end winner (2nd place) "wins" a rubber chicken and must keep it for next year's "winner".